You’ve got a loyal fanbase for your freemium product. Great news. But how do you get those users over the payment hurdle to become paid subscribers? 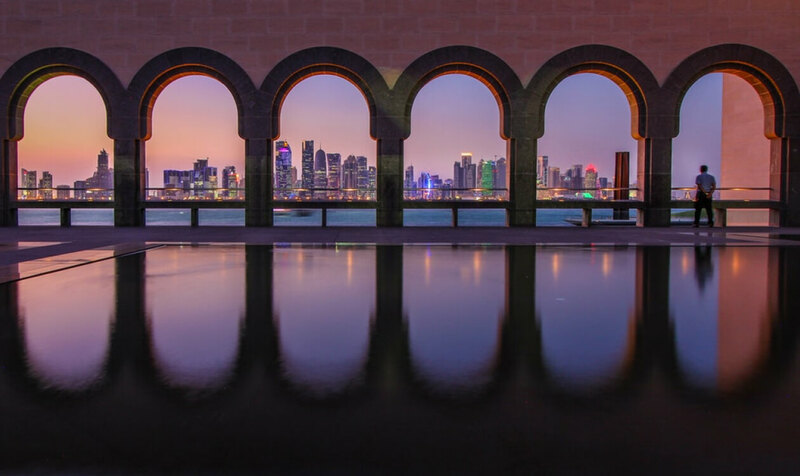 Here are 6 key steps to convert your free users into paying premium customers. People like free things. They also like to try a service before they buy. Even more, they like to keep using a service they require for free. Moving your free customers to a paid subscription is a common pain point for SaaS companies, as the immediate and continual access to a basic version of software is relatively convenient for a potential customer with a firm hold on their purse strings. Fear not, though, there is great value in having a freemium model in place - and several ways to encourage your free users to convert. Why Offer a Freemium Product? 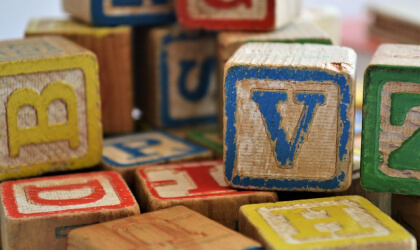 We recently touched upon the psychology behind a freemium product. Unlike a limited free trial, a freemium product is based around the ‘endowment effect’, where a person values something more as a result of owning a part of it. When a potential customer has your software downloaded and your icon on their desktop or smartphone, it’s already a partial commitment to your brand. They’ve integrated your product into their work or play - they’re in prime position for conversion. 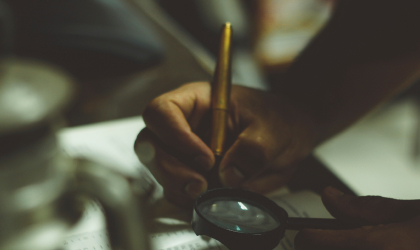 Your freemium product can provide valuable insight into your market. By tracking how free users are interacting with your software, you can better understand what people want from your product - and get the balance just right between what you offer for free and what you hold back for premium customers. Freemium also gets your brand name and services out there far faster than if you were to charge for your product from the offset. When we looked at key metrics to track for converting freemium to paid, we considered the potential of freemium to reach a wide audience. Spotify, for example, reported a 27% conversion rate to their premium subscription. Out of its 75 million monthly users, that means 20 million upgraded their freemium accounts. Think it’s impossible to encourage your free users to take the leap? Think again. The users of your freemium product just needs the right balance of support, urgency and incentive to upgrade. Here are 6 key techniques to get your users from freemium to premium. This technique is all about moving your free users down the funnel. Treat them like valued, paying customers and they’re far more likely to become just that. A simple and friendly onboarding email that introduces your software will get them up and running swiftly, while a clear link to a contact email address/help pages/FAQs will demonstrate that you strive to offer a positive user experience. A line about the benefits of the premium service and a link to upgrade is important, but don’t make it the focus of the welcome email. 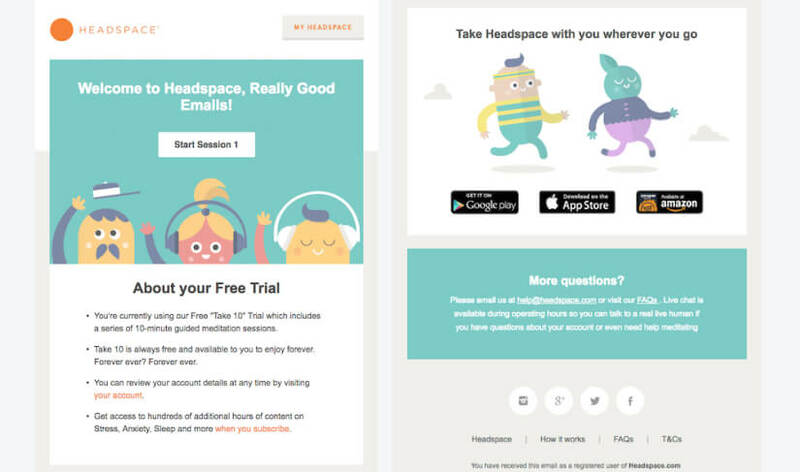 Mindfulness app Headspace may call their freemium plan a ‘free trial’ but they open with the promise that it’s always available, with a clear link to get started, links to customer support and a friendly reminder about their premium service with a link to subscribe. Simplicity and ease of set-up means a lot to a potential premium customer. After that, keep the lines of communication open. Send your free user interesting educational content that helps them use the freemium model while signposting the benefits of the premium model. No one wants to use a freemium service that bombards them with emails to upgrade straight off the bat, but drip-feeding the benefits of an upgrade in your communication can lead to a more organic progression from freemium to paid. This isn’t just urgency in the form of ‘your trial will expire in 2 days’; there are other very effective ways to get free users to act quickly. Time-sensitive promotions or one-off gift offers are a great way to give users already considering an upgrade that little push. 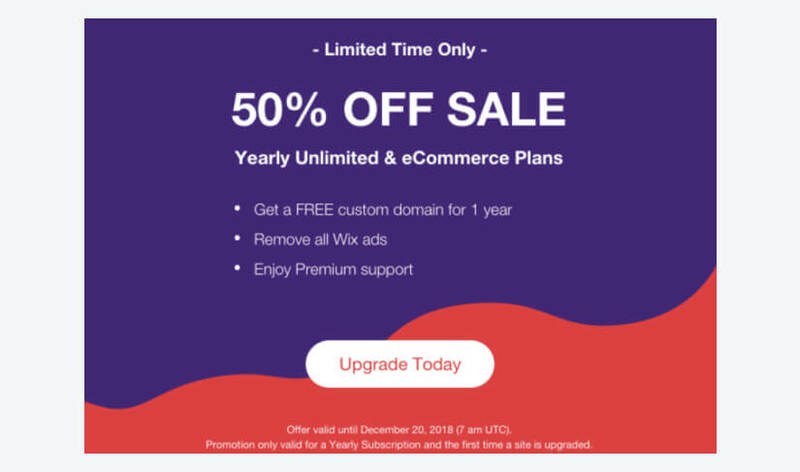 Website builder Wix know how to capture the urgency of new website owners using their freemium plan, offering 50% off an upgrade for a limited period. People also hate missing out. When faced with an email or notification like that of LinkedIn’s ‘10 people have looked at your profile today’, it creates a different kind of urgency. Not only does an upgrade promise the information you’re missing, it also promises a way to act on it: when you upgrade with LinkedIn, your messaging capabilities to reach out to the people viewing your profile increase. In short, let your free users know that premium users have access to the fuller picture. 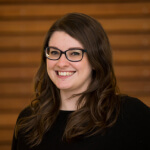 Your freemium model is invaluable when it comes to testing out what people value; use your findings to tailor these kinds of communications to the individual user and tap into what matters most to them to encourage an upgrade. Seen by some as a stepping stone to help get your free users to premium, the promise of unlocked features for a lower fee than a full upgrade can be a lucrative step for some SaaS companies. It’s an important consideration for your company, though, as you may not want to give freemium customers the only feature they want from an upgrade for a fraction of the price. It can also be difficult to come back from offering your service in fractured parts. What it can do, however, is help break down your potential customer’s mental payment wall. The step between paying nothing and paying something, however little, is the most significant step for a user of your product. Once they’re past that first commitment, they’re more likely to make a full upgrade. Their brand loyalty is evidently there - and the financial reservations that were holding them back have been eased by the smoothness of the transition to a new, paid-for feature. Note-taking app Agenda uses this model, promising a free product without time limits that can be tailor-made to your requirements with the addition of paid, individual premium features. No one likes adverts. People can just about put up with them in the side-panel of a screen, but when they’re interrupting your music or your game play, the idea of getting rid of them entirely is very appealing. If you use ads to support your free product, it’s worth offering a premium, ad-free version. 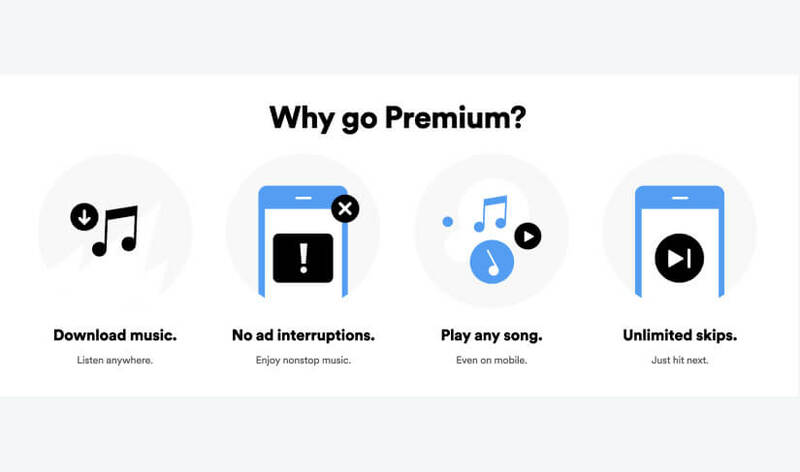 Spotify is a widely-used example of a program whose premium upgrade involves the permanent removal of all ads. Many games, for example the popular iOS and Android word game Words With Friends, also offer the option of a one-off payment to ‘upgrade’ to a version of the game uninterrupted by adverts. There’s nothing wrong with showing your free customers what they’re missing. The last thing you want to do is make the freemium option so comprehensive there’s no drive to upgrade, so why not style your freemium model on the premium model but just highlight or grey out the options that are unavailable unless you upgrade? 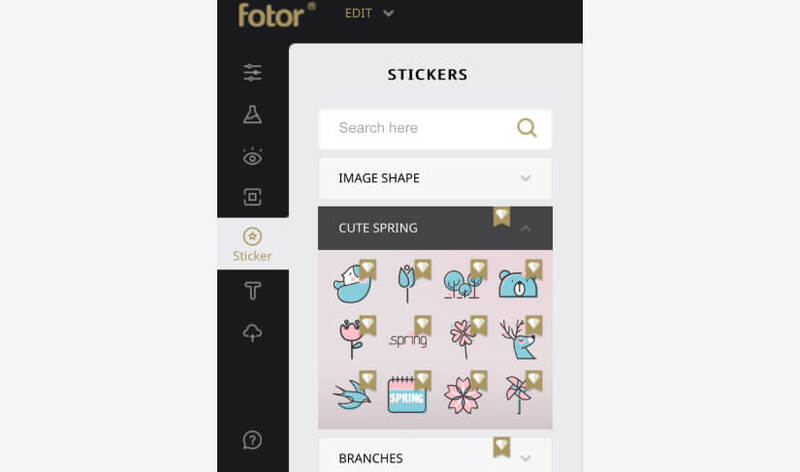 Image editor Fotor likes to tease what’s on offer with their premium package by showing all of their tools in the freemium edition and simply flagging their premium tools and features with a little gold diamond. This way, their potential customers feel the freemium limit every time they use the product. 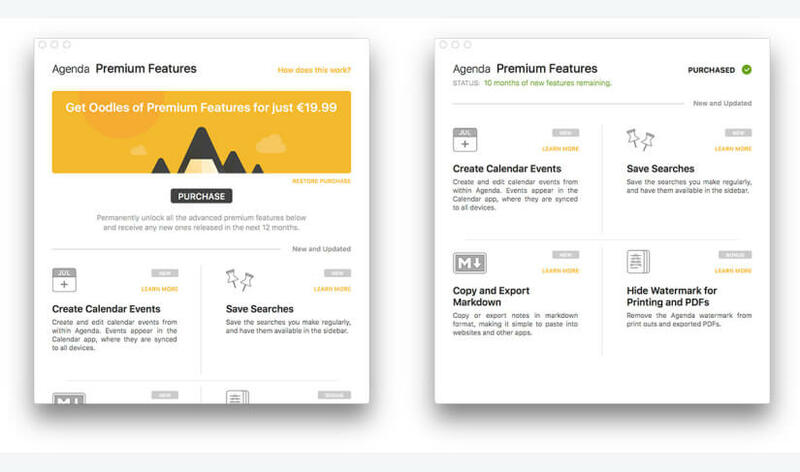 It embeds the value of the paid feature into their flow - these premium features are not elusive options on a pricing page, but tangible features they currently cannot access. Users are regularly reminded of what they’re missing. If upgrading even begins to look like a hassle to your freemium user, they’re likely to rethink or even give up on going premium. Users are far more likely to abandon their purchase if there are too many hurdles to jump to get what they want. Make the transition easy - this means taking the minimum information required to get your new premium customer set up. If setting up a profile or entering personal details can wait, don’t make it part of the conversion process. You can point your new customer to this option once they have the access they require from your product. It’s a good idea for your business to consider collecting payment details when each user begins using your free product, as according to Tomasz Tunguz an average of 10% of unassisted leads convert when payment is collected before the use of a trial or free product. This is compared to the 4% who convert when payment hasn’t previously been collected. If you’re looking to increase your freemium to premium conversion rate around the world, Paddle’s checkout solution can support you. 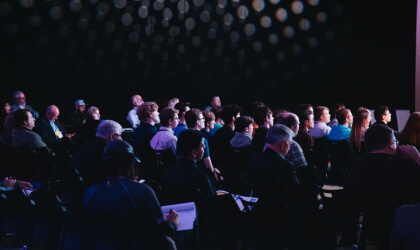 Check out our recent webinar on growing your SaaS company here for further examples of freemium to premium success stories. You can find out more about Paddle and request a demo here.